“This type of data collection and management will become a standard requirement for police departments in the near future," Scott Patterson, President of DragonEye Technology, said. 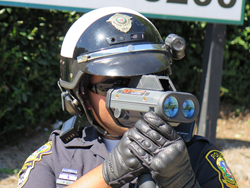 There were only two times in history when technology revolutionized speed enforcement. When Teddy Roosevelt was the New York City Police Commissioner, he started the bicycle “Scorcher Squad” to apprehend speeding horse carriages. Next was the wide-spread adoption of police radar and the introduction of Lidar. According to experts, the industry is on the verge of a third. The revolution this time is in the form of software. Both Lidar and radar guns are helpful to law enforcement but police still record the data by hand — the same way they did when those devices were invented. For this reason, All Traffic Solutions and DragonEye Technology developed the TraffiCloud Enforcement Suite, combining All Traffic Solution’s TraffiCloud Web-Based Management Services with Dragoneye’s Lidar devices. This partnership makes it easier for departments to improve accuracy, save time and reduce court challenges. Officers using TraffiCloud-enabled Lidar have vehicle speed, distance, direction and the time of each capture recorded instantly to the TraffiCloud. They can also add notes and images to each capture. The system tracks the effectiveness of enforcement efforts with data such as how many captures were taken, the number of citations written and statistics on the enforcement session. While best-in-class hardware like Lidar helps improve traffic enforcement, many departments are still looking for complementary software to improve the effectiveness of the officers’ time in the field so they are more efficient when they’re back in the office. With the TraffiCloud Enforcement Suite, the captured data is uploaded, confirmed and essentially ready before officers get back to their desks. Additionally, officers can access the data needed for court with a click of a mouse. No more scrambling for daily test logs. The TraffiCloud gives the officer the ability to log daily accuracy tests and save certification documents. This is vital in supporting the accuracy of the instrument and ensuring that fewer citations will be disputed resulting in quicker citation resolution. Another benefit to departments is utilizing other TraffiCloud connected equipment, such as speed displays, to collect traffic data at an enforcement site. Having the 85th percentile speed at the enforcement location can be used to confirm that the violator is an outlier and warranted a citation. Radar and Lidar may still be seen as revolutionary in speed enforcement, but cloud technology enabling the devices is the silver lining. Located in State College, PA., All Traffic Solutions is consistently recognized as a leading innovator in the traffic safety market and is the developer of the TraffiCloud, a web-based ecosystem for managing traffic safety equipment. By integrating cloud technology into products, All Traffic Solutions allows customers to manage all their equipment and data remotely through a browser resulting in better traffic safety outcomes.